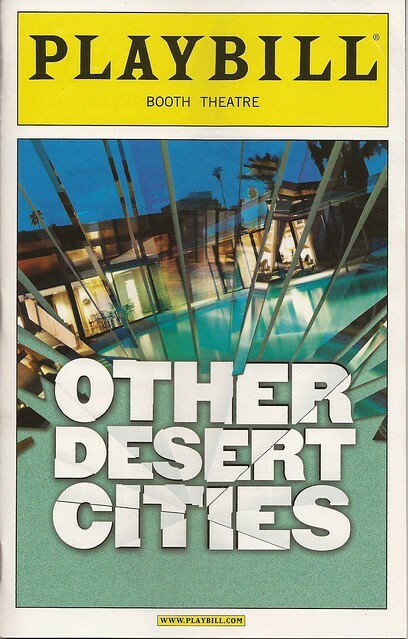 The hottest ticket on Broadway right now is Other Desert Cities, a family/political drama by playwright Jon Robin Baitz, who my be best known for creating the television drama Brothers & Sisters. Like that show’s early days, Other Desert Cities explores big political issues by filtering them through a family’s internal rifts, recriminations, and love for one another. In this case, the play focuses primarily on the Wyeth family’s Christmas gathering in Palm Springs, California, where the elder Wyeths, Polly and Lyman, played by Stockard Channing and Stacy Keach, live. Polly and Lyman are Old Guard Republicans who remain active in a certain kind of Republican circle. Lyman was a former actor, much like Reagan, and was appointed an ambassador during his administration. Polly is friends with Nancy. Polly and Lyman have taken in Polly’s sister, Silda, played by Judith Light, who has had a drug problem. Now out of rehab with no place to go, she resents living with her sister in part due to their former success as a screenwriting partnership, which broke up with Polly’s turn to Republican conservatism. As Silda constantly reminds her, Polly is a Jew who plays the part of a transplanted-Texas WASP. Rounding out the family gathering are the Wyeth “children,” both of whom are adults. Rachel Griffiths plays Brooke, an emotionally delicate writer who suffered from a six-year emotional breakdown after the publication of her first novel but who now insists that she knows how to manage her depression. Trip Wyeth, played by Matthew Risch, who will soon be replaced by Justin Kirk, is a producer on a cheesy Judge Judy type of television show in which celebrities serve on a jury and decide cases. 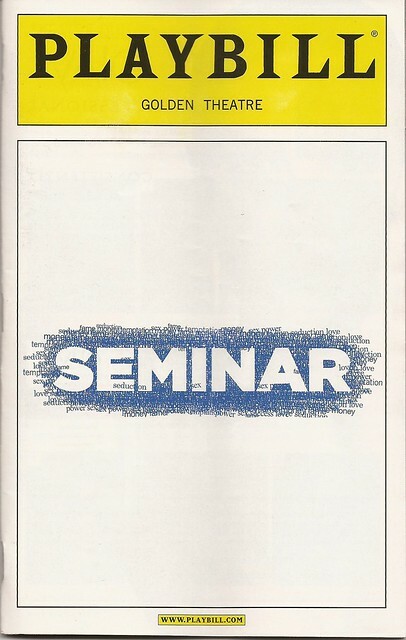 The third–and best–show that PJ and I saw in New York with our friends last week was Seminar, which stars Alan Rickman as Leonard, a problematic creative writing instructor teaching a private seminar for four up and coming writers. Paying $5,000 for the opportunity to study with him, these four students get more than they bargained for as Leonard upends all of their notions of what it means to be a successful writer. Seminar is hilariously witty and a crowd-pleaser (even if you’re not an English professor!). Rickman is excellent as Leonard, a boozing, lecherous, washed-up writer who makes end meet by writing magazine stories and teaching these private seminars. He imbues Leonard with life, pathos, and egotism, making him a fully rounded character when he could easily be a one-dimensional stereotype instead. 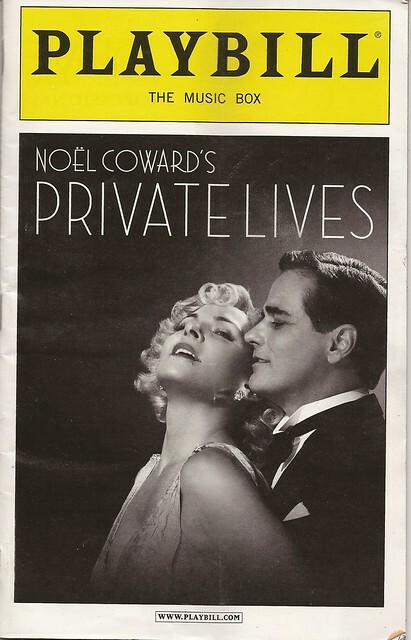 The second show PJ and I saw last week in New York was the revival of Noel Coward’s Private Lives starring Kim Cattrall and Paul Gross, who play Amanda and Elyot, respectively, a divorced couple who meet again during their honeymoons with their new spouses. Both quickly realize that they’re still in love, and comic mayhem ensues as they flee their new spouses and run off together to Amanda’s Paris apartment. The reason their previous marriage fell apart five years ago, however, was that Elyot and Amanda fight as passionately as they make love. We see both sides of their relationship in Acts 2 and 3. This next sentence is probably one of the gayest things I’ve ever written: one of my favorite plays as a kid was Private Lives. The third show PJ and I saw in New York was La Bete, a 1991 play that takes place in seventeenth-century France. David Hyde Pierce plays Elomire, a stuffy playwright attached to the court of a princess, played by Joanna Lumley. When a new playwright catches the princess’s eye, Elomire must figure out how to convince her that her new favorite is, in fact, an idiot rather than a genius. Mark Rylance plays Valere, the buffoonish newcomer. Basically, this is a play about plays. I tend to enjoy this sort of work, and I generally enjoyed La Bete. The first thing you notice is the set design. The walls of shelves with books is definitely impressive. I was a little skeptical at first — a busy set can sometimes overwhelm the action. But that didn’t happen in this play. There’s only one location in this relatively short comedy, so having a more detailed set works well. David Hyde Pierce is very good in his role as the solid playwright who tends toward the tragic. He is not amused by Valere’s rise. To the contrary, he sees his rival as the very epitome of lowbrow, inane entertainment that cheapens the theater rather than elevates it. 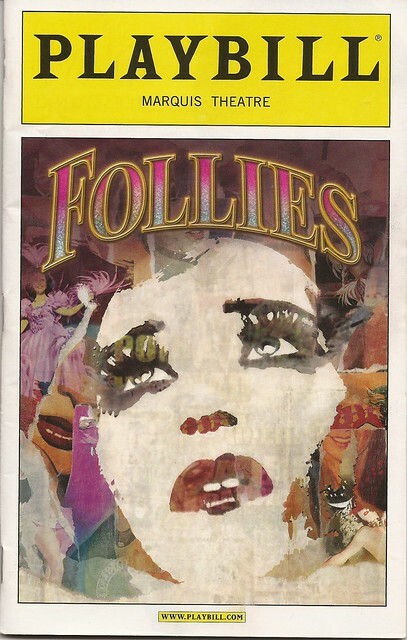 This view gives the play its primary relevance — it rehearses many of the same arguments various people make today about the debasement of culture due to television, bad pop music, and broadway shows based on second-rate movies. Before seeing the show, we had heard a little about the production (in addition to knowing the original Green Day album well). What we had heard was that there are three plot lines but that they three stories don’t really jive together well. We had also heard that it’s all a little confusing. After seeing it, we thought that these comments were ludicrous. The plot does revolve around three guys. They want to move to the city and start a band, but one of them ends up not being able to leave their home town because his girlfriend gets pregnant. The other two go anyway, but they soon part company when one of them joins the army and the other one becomes a drug addict. The show follows their separate lives over the course of about 6 months or so. All of it is very clear and not only easy to follow but also engaging, at times dazzling, and very entertaining. 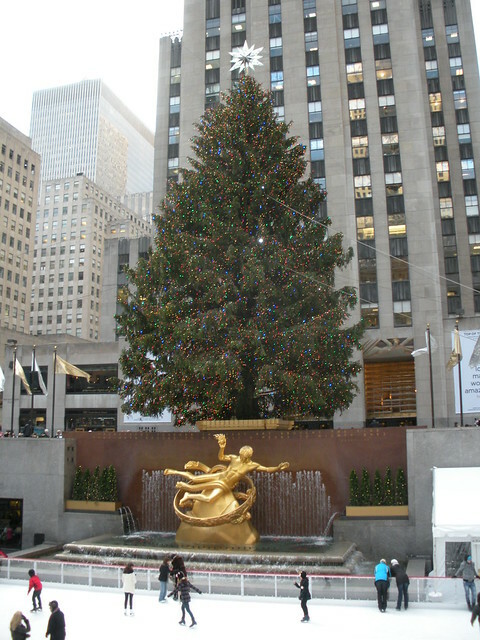 Yesterday, PJ and I got back from our annual trip to New York City. As usual, we had a great time, even though the trip was a little different than in the past. This year I spent a significant part of the trip working rather than being a tourist. While PJ visited the sites (and caught up with an old friend), I met with a handful of my college’s alumni. Partly this was for development purposes, but it was also part of a larger effort to reconnect my college with its alumni. So, whenever I travel this year I’m trying to combine it with lunches, dinners, breakfasts, or coffees with alumni. Since I don’t actually have an official travel budget, I’m having to pay for some of the travel myself, which means that I’m trying to combine it with trips we already take or with places that I don’t mind going. Like New York! The development stuff went well enough. You never know exactly how all that’s going to go in advance. I learned a lot of good stuff — not all of it pleasant — but all of it helpful in doing my job. The only downside to the alumni meetings was that it left me little time for sightseeing. For the first time since we started visiting New York, I didn’t see any museums. But we did see some shows. 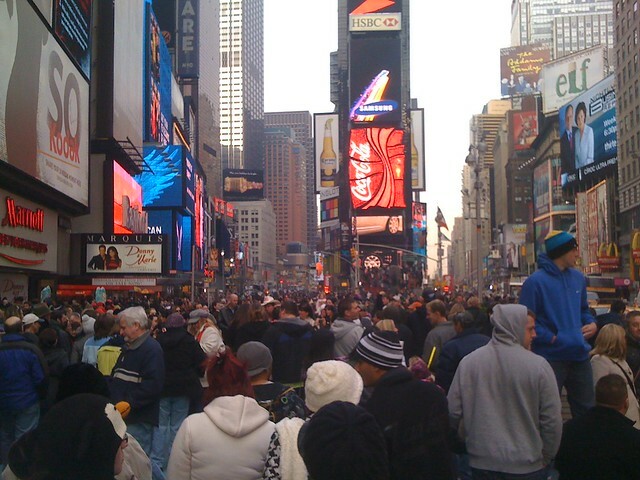 We arrived in the city on Tuesday. That night we saw A Little Night Music with Bernadette Peters and Elaine Stritch. On Wednesday we didn’t see any shows; instead, PJ met up with a college friend and I met with an alum. On Thursday, we saw American Idiot. On Friday, we got tickets to La Bete, starring David Hyde Pierce, Joanna Lumley, and Mark Rylance. And on Saturday we saw Time Stands Still with Laura Linney. I’ll review each in more detail later. We also ate incredibly well (as usual). We had more Italian this time than we usually do, but we also had Thai, Mexican, and Greek, and PJ had Vietnamese. And finally, we saw Black Swan starring Natalie Portman, which I’ll review later. So, all in all, it was a fun, successful trip. I just wish that I had made it to a museum or two. Next year, I’ll also try to consolidate my alumni visits into one or two days, giving myself more time to play. Recently PJ and I watched a documentary titled Theater of War, which is about The Public Theater’s 2006 production of Mother Courage and Her Children starring Meryl Streep. The stage production was directed by George C. Wolfe and was newly translated into English by Tony Kushner. We had just received our Netflix for Wii and wanted to watch something just to try it out. Of course anything starring Streep was going to catch our eye, and we both love the theater and Bertolt Brecht’s work in particular. Theater of War turns out to be an excellent and engrossing documentary that covers a lot more than just this one production.